If you’ve played the original The Legend of Zelda, then you’ll instantly know how to play this game. If you haven’t, you’ll still know. The game needs no tutorial on how to play. It’s the quickest way to just jump right into a game. 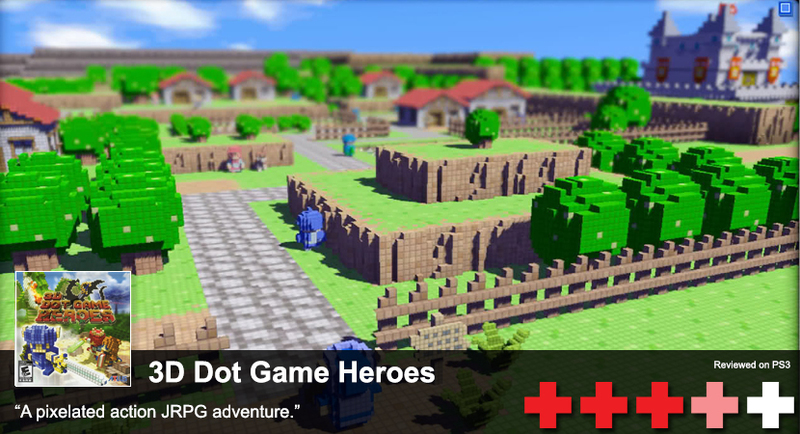 3D Dot Game Heroes is about a legendary hero that has to save the land from an evil curse that has turned this poor 2D world into a twisted 3D abomination. You’ll go from town to town, getting side-quest for the town’s folks, while keeping on track with the main quest. What’s the main quest? Visit several dungeons throughout the land, solving the riddles within, and then fighting the end stage bosses. During so, you’ll collect new items that help you venture to new areas of the world. Afterwards, you’ll get a heart-piece and a new magical ability that helps you restore the land. I hope this sounds familiar because it’s exactly like the original Legend of Zelda. The game more accurately feels like a mashup of Final Fantasy—such at the towns—with The Legend of Zelda: A Link to the Past for the Super Nintendo, while looking similar to the original 8-bit top-down The Legend of Zelda for the NES. The reason I feel it’s closer to the Super NES is because the lands that you visit are really distinct. For instance, you might be in a dark forest in one area, but then with little warning, be on the side of a volcano. If you really enjoy the nostalgic side of gaming, then this will be nostalgia heaven. Even the music sounds just like the original Zelda! 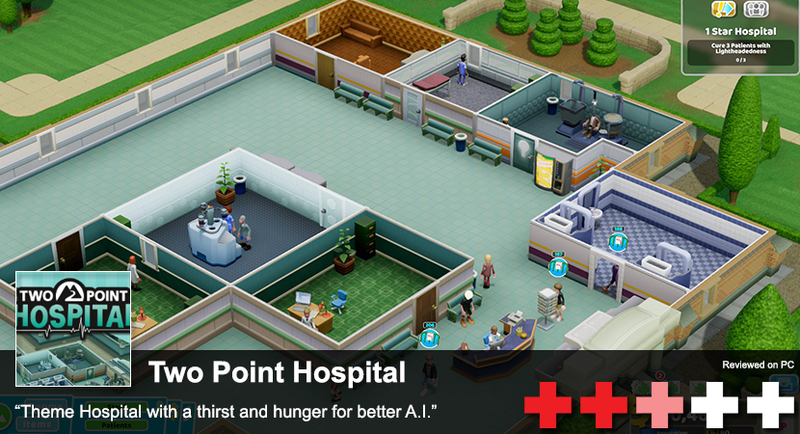 This game is just riddled in humor too. There’s jokes about several 2D gamers from the past. Even jokes hidden throughout about their other popular title, Demon’s Souls, and how hard it is. And this is a good thing. If you’re expecting a deep RPG, then look elsewhere. This is just here for the fun of it. The graphics are actually impressive. For a 2D/3D hybrid, the game actually shines a bit and whatever Atlus used for their engine, they need to keep. It’s not the game that’s going to grab people’s attention with it’s HDR lighting and killer water effects, but it will probably grab their attention because of it’s uniqueness. The gameplay is, again, just like the original Zeldas. You pick up a sword, block attacks, use a little magic, and move on to the next area. You actually do get to collect more than just coins and health. There’s several unlockable swords throughout the game. Some of the swords are just flat-out bizarre. A little spoiler warning for this part, but one of the more hilarious swords you find is a “beam saber”, which is a Jedi’s trusty lightsaber in the form of pixel art. The magic you get to use is very helpful when fighting certain monsters, but ultimately, you’re going to rely on keeping your health to max for that special full-fledged sword attack. 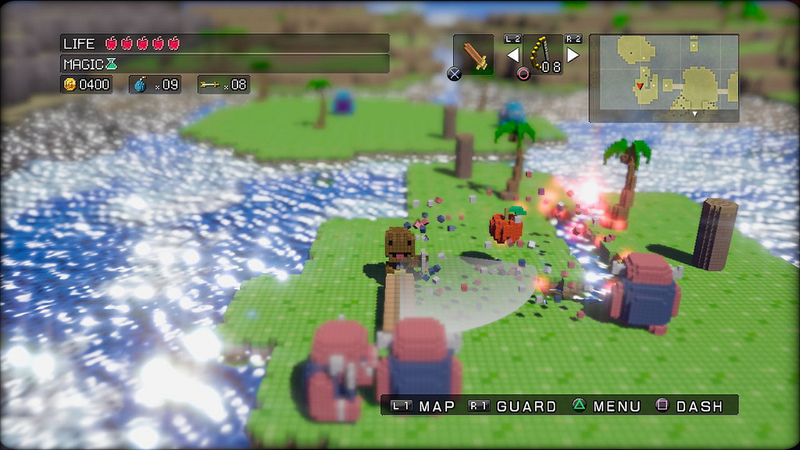 You can download several 8-bit versions of popular video game characters, including Sackboy. If you tire from the grinding of dungeons, you can also do little mini-games such as a tower defense game, a time circuit game, and others. Truly, the tower defense is the best of the lot. These mini-games are required to achieve some of the trophies. And let’s talk about this racing game. It’s hard. It’s probably the only thing that I dislike about the game a lot. The times that you have to beat seem to just be impossible. But alas, it’s only a side part of the game. If you can go back and beat any old Final Fantasy game or Zelda games, then this is just another old school adventure.